It was only last week that vandals stuffed lit fireworks through a back-door letterbox in Maidenhead. The firework season has started and many accounts of home arson attacks have been reported across the UK already. 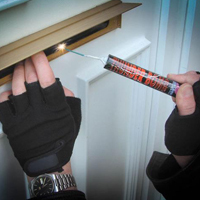 The Postbox Shop recognise that one of the largest fire risks in residential areas remains fireworks through letterboxes, therefore we can provide you with the perfect protection against this attack, with our anti arson letterbox range. Please browse our quality letterboxes, each anti arson letterbox includes an anti theft baffle too, each manufactured for maximum durability. The trespassers got into the back garden of the home through a side gate and committed acts of vandalism, before lighting fireworks and forcing them through the letterbox, which consequently set fire to curtains hanging behind the door. The house owners were lucky that the fire burnt out causing minor damage. Protect your home from an arson attack today with our fireproof letterboxes.